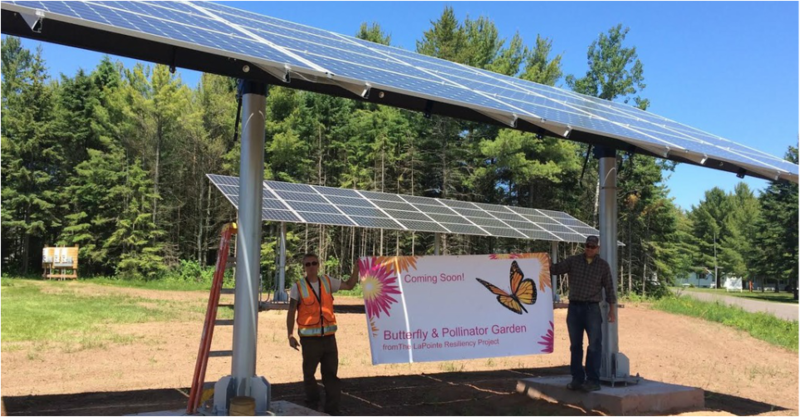 This project is viewed as the first step in the Madeline Island Resiliency Project, an effort to develop more locally produced, sustainable energy sources. Chippewa Valley Alternative Energy developed the plan and this initial array was installed by North Wind Renewable Energy of Stevens Point, Wisconsin. It was funded by a $75,000 grant from the U.S. Department of Energy with funds administered by the Office of Energy Innovation, Public Service Commission of Wisconsin. The Madeline Island Library Board provided an additional $20,000. Check back here for more information as this project grows or contact the Town of La Pointe Administrator, Lisa Potswald, at 715-747-6914 or lapointeta@cheqnet.net.